I’ve recently taken a little hiatus from a lot in life; but it’s for a good reason. My little family recently welcomed our 2nd precious little baby girl. While it’s been a rollercoaster of emotions and new experiences, it’s been a truly beautiful time. Through this experience, I learned many new things. Even though this is my second child, there were a lot of new experiences to be had and lessons to be learned. This post is dedicated to sharing just some of what I have come to know while welcoming baby #2 :). 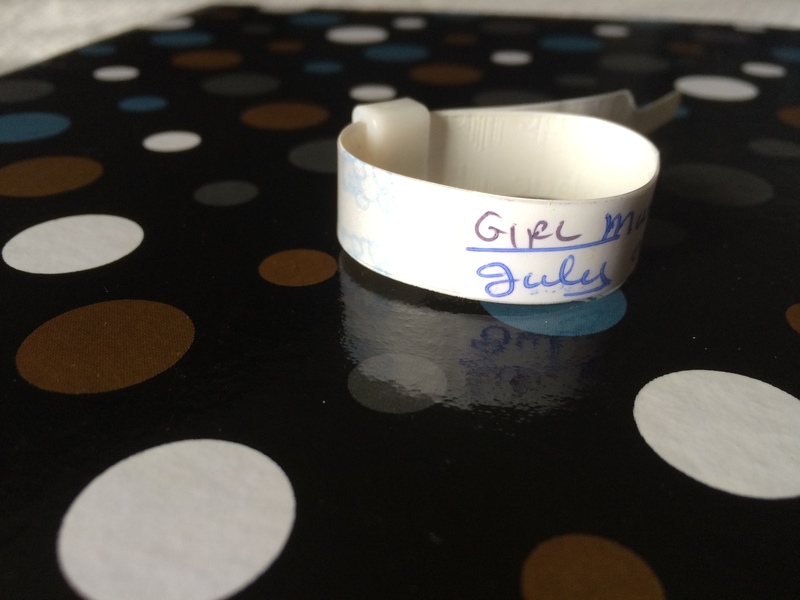 Our newest addition’s hospital band, ready to go into my memory box :). Remember this lovely experience? If you’ve been through it before, how can you not! My main lesson learned here is to be ready to expect anything. Not all of your labors and deliveries are the same. Your first experience can be drastically different then your second or third, and that’s ok. Look at it this way: each baby is different, and they deserve their own unique entry into this world. The delivery I expected and what I experienced could not have been more opposite. However, I know truly feel that it was part of a divine plan all to help me grow and form unique bonds with my newest little bundle. A little tip here: Try writing out your labor and delivery story for each child you have. We’re all interested to know how we came to be in this world, and it’s also a therapeutic exercise for you :). The key here though, is to write down the experience while it’s still fresh in your memory. This blanket was given to me by my cousin, after she used it for her daughter and realized how flexible and lightweight it was. Notice I wrote, “from those your trust”… that’s the most important part. Why not use the experience other mom’s have gone through as your own personal guide? Some of my most used and treasured items are hand-me downs (or buying tips) from mom’s around me who I really trust. 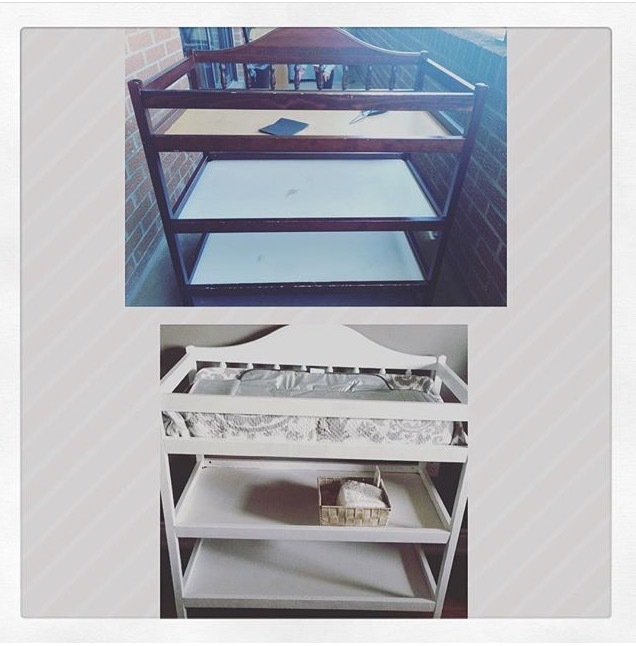 This table was another hand-me down, which my husband and I re-painted to match our nursery and give it a fresh look. It’ll save you some expenses (and who doesn’t love that :)). It’ll create treasured family heirlooms and deepen the beloved memories you may already have. However, reusing old furniture or clothes can feel boring or outdated. This is when you can take on a little project and repurpose some of those old or worn out supplies. 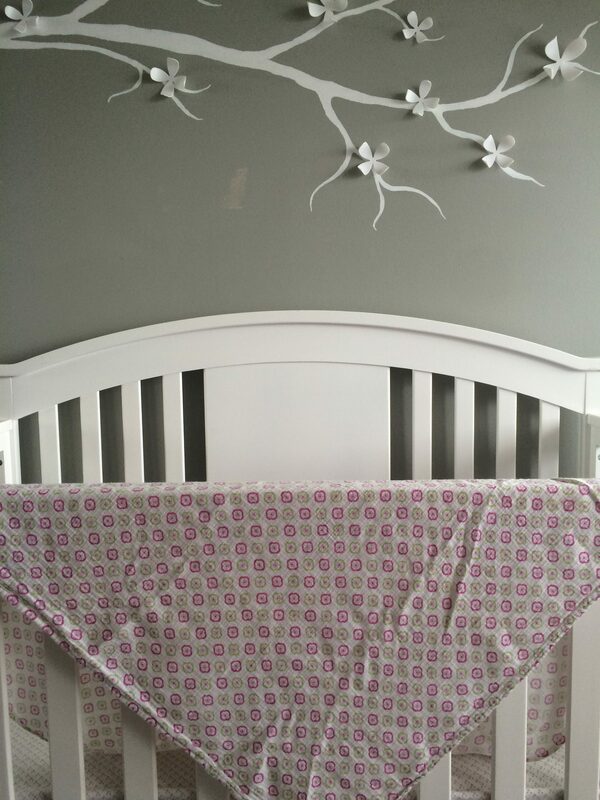 Whether its painting over chipped furniture or adding new trimming to an old blanket, this can be a fun and exciting project to give your new baby it’s own unique flare. 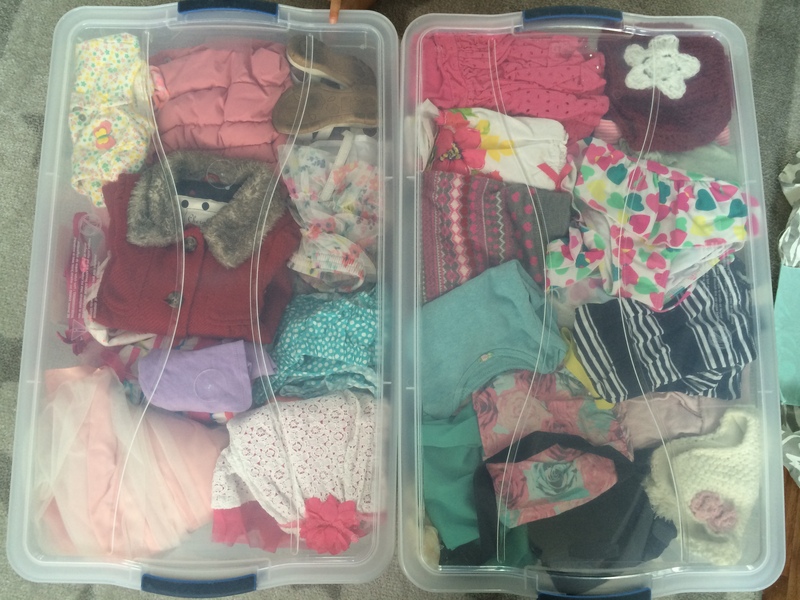 Some of my oldest daughter’s clothes, in storage bins. When I had my first daughter, I made sure that I kept her belongings neatly stored away. I also made sure to purchase gender neutral furniture and accessories whenever possible. I did this because I saw how expensive (and sometimes wasteful) is can be to keep up with the needs of a baby. However, I quickly learned that saving everything was creating a huge clutter in my home. So, I started to purge anything that I didn’t absolutely love or need. This included clothes that were worn out and anything that caused even slight discomfort. This will ensure you’ve got something stored away, but only the things you really loved to begin with. It will make going through these old belongings even more special. A new addition to the family is not just a shock and adjustment for you, but for your first child as well. 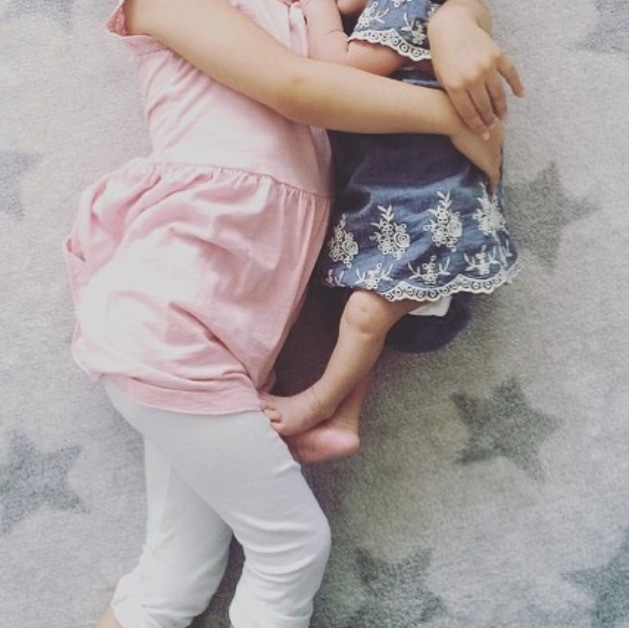 They may feel awkward or even neglected at first, and I found that it was really useful to make my daughter feel as though she was involved in the care of her sister. I asked her to pass me diapers, help me fold up blankets and wipe away dribble. She loved this, and I saw her affection for her sister grow day by day. But, that’s not the only reason this is helpful. It gets your kids used to some responsibility and gives you a break, even if it is minuscule. 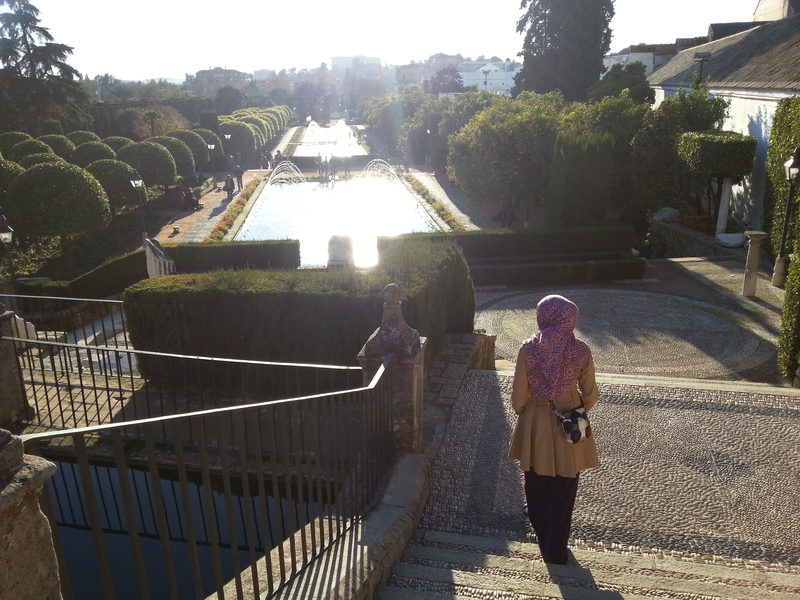 A pic of our first babymoon in Spain. Your second child will undoubtedly turn your world upside down. Nothing will quite be as it once was, and I truly regret not taking a baby-moon during my second pregnancy. If nothing else, it’s a nice way to feel rejuvenated before a big life change, while also celebrating a new family milestone :). What was your biggest lesson with baby #2? Congratulations on your newest addition! I could relate to so much of what you wrote. My first and second delivery stories were extremely different, too! Take care and enjoy snuggling with your little one!